As you may already know, Apple Mail can be used as an RSS reader to subscribe to news feeds on websites. So, out-of-the-box, Mac OS X will have Apple Mail automatically configured to be the default news reader on your computer, but as you'll learn in this tutorial, this can be changed quite easily. And since one of the best RSS readers is designed for Mac, trying out another reader may well be worth your time (it used to be shareware, but it is now freeware). Correctly setting the default RSS reader on your Mac is useful, since it will automatically launch when you click on an RSS feed inside a web page or website, regardless of the web browser you happen to be using at the time. Once you are inside Apple Mail, click on the Mail menu, and choose "Preferences". When the options dialog opens, select the "RSS" tab at the top. You will see your current RSS reader listed at the top, followed by any application Mac OS X has identified as valid RSS reader, including Safari, which lets you read news articles directly from the comfort of your web browser. At the bottom of the Default RSS Reader menu will be a "Select..." entry: if you do not see the RSS reader program you want to use as the default, click on Select, and a Finder dialog will open and let you navigate to a folder of your choice to select the reader you'd like. 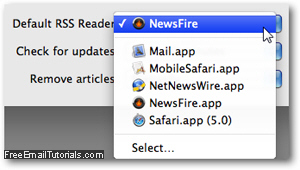 This is all you need to do to change the default RSS reader in Mac OS X! Aside from that, you have a couple of options which pertain to Mac Mail itself as RSS reader, not outside applications: how often to check for new posts in RSS feeds (select a time interval value under "Check for updates"), and if Apple Mail should automatically delete old news items (pick an option under "Remove articles") - again, these last two settings apply to the RSS reading functionality built into Mail, not outside readers. When you have finished customizing your RSS reader settings in Mac Mail, hit Esc to close the Preferences dialog and hit Return (or click "Save") to apply your new options.